Very Good. 384 p. A practicing clinical psychologist for children and adolescents, Anthony Wolf, author of the phenomenal bestseller Get Out Of My Life, But First Can You Drive Me and Cheryl to the Mall? ("I love this book! "-Parenting Magazine) returns with another wise, funny, and eminently practical guide to raising and understanding teenagers. Good. 384 p. A practicing clinical psychologist for children and adolescents, Anthony Wolf, author of the phenomenal bestseller Get Out Of My Life, But First Can You Drive Me and Cheryl to the Mall? ("I love this book! "-Parenting Magazine) returns with another wise, funny, and eminently practical guide to raising and understanding teenagers. New. 2011. Original. Paperback. 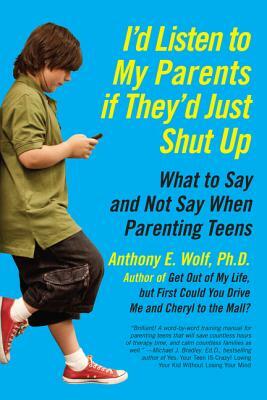 Offers dialogue-based advice for the parents of teenagers. Num Pages: 384 pages. BIC Classification: VFXC1. Category: (G) General (US: Trade). Dimension: 155 x 230 x 26. Weight in Grams: 380......We ship daily from our Bookshop.